Chuck Pontone is the latest to be inducted into the Bacon squad. To celebrate adding Chuck to the Bacon Skateboards team, they hit the road and got some clips on sweet Oregon Concrete. Watch as Chuck tours backyards and skateparks in search of the perfect transition. Platform Distribution Is The Canadian Skateboard Distributor for Bacon Skateboards. We are super excited to be a sponsor of the 1st Annual Ash Bowl Bash! The event had 30 skaters in the concrete bowl and over 200 spectators in attendance. This is the first of many skate contests that will be happening at the Ash Bowl. Follow @ashbowlbash on Instagram to keep up to date with what is happening. Speedlab Wheels were a proud sponsor of the event. We all dream of skateboarding all day. Evan Okeson gets to build skateboarding all day. He works for Grindline Skateparks and travels the USA making dreams come true. Skatepark ideas come to reality through his and all he other Grindline employees hard work. Justin Modica noticed that he can build skateparks, and rip in them. Newest Am skateboarder added to the SENDXHELP Skateboards team is Evan Okeson. Watch the video as Evan takes a break from building and skates the parts that are done with Justin Modica. Team ride Justin Modica flies to Texas to see his best bud Evan Okeson at his job site (Grindline Skateparks) and introduces him to the team! Give him a a warm welcome, its the fabulous EVAN OKESON!! Riding for SEND HELP SKATEBOARDS!!!! Yeeehawwww!! 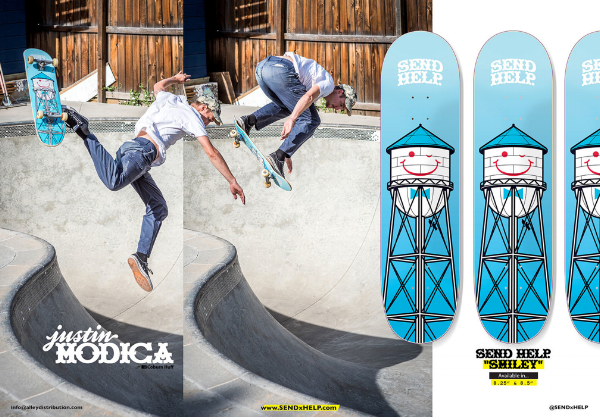 Send Help Skateboards are distributed in Canada through Platform Distribution. Vagrant Skateboards has been adding a few new rippers to the team this winter. First up is Archer Braun. Platform Distribution is the wholesale distributor for Vagrant Skateboards in Canada. Kevin Kelly hit us up to sponsor the re-birth of the Kensington Bowl skate contest. We jumped at the chance to see what can happen in this bowl. Lifeblood Skateboards and Vagrant Skateboards were the brands that leapt to sponsor this event. Great day of skating, thanks to Out Of Step Productions for creating the video recap below. Special Thanks: Kevin Kelly Jeff Cole Dennis Regan Wee and Family Olga Aguilar Everyone Who Skated All the Sponsors Anyone else who helped make this rad day happen! The Hoedown At The Hoof video recap is up on King Skateboard Mag. Watch and see Adam Hopkins from Lifeblood Skateboards compete against some of North Americas best skaters. Riley Boland, Willy Lara, and Andre Young are just a few of the top competitors that came to Vanderhoof skatepark to skate under the hot sun. Things get wild when you bring that many skateboarders together. Couches get stacked, handplants go on helmets, and someone is going upside down. Watch this recap all caught by Tomas Morrison. Platform Distribution is the Wholesale Canadian Distributor for Lifeblood Skateboards.